What to watch for at the U.N.: World leaders who dislike U.S.
Explainer: Leaders who dislike the U.S.
Former Cuban President Fidel Castro before the U.N. General Assembly in 1960. From meandering rants to impassioned speeches, world leaders have used the annual U.N. General Debate to launch attacks against the United States. Take Fidel Castro, for example. 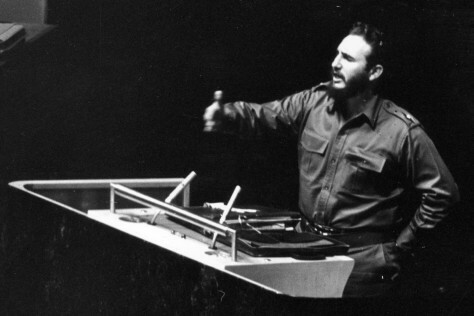 In 1960, the former Cuban president unleashed a record-setting four-hour, 29-minute speech in which he denounced the U.S.
On Thursday, representatives of 192 countries will gather at the U.N. General Assembly in New York for this year's General Debate. Once again, some may use the forum to take on America. Leaders to watch: Iranian President Mahmoud Ahmadinejad, Venezuela's Hugo Chavez, Bolivia's Evo Morales, Nicaragua's Daniel Ortega, Zimbabwe's Robert Mugabe, Cuba’s Raul Castro and Libya's Moammar Gadhafi. Click on next, or scroll down, to find out who likened former President Ronald Reagan to Rambo, who quipped to the U.N. that it "doesn't smell like sulfur anymore" and who delivered a tirade so exhausting even his personal interpreter passed out. Beef with the U.S.: There are many, but sanctions against Tehran over nuclear technology is a top issue. Background: In the past, Ahmadinejad has used the general debate as a forum to defend Iran's nuclear program and assail its arch foes Israel and the United States, typically prompting walkouts by the U.S. and some European countries. Since the 1979 revolution that overthrew Iran's monarchy, Tehran and Washington have had no official relationship, a rift widened amid concerns about Iran's nuclear program and its human rights record. A Holocaust denier, Ahmadinejad accuses "Zionists" of preventing U.S. President Barack Obama from improving relations with Iran. 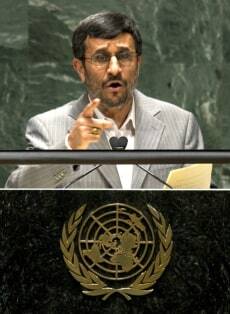 Ahmadinejad has repeatedly said that Iran's nuclear program is for peaceful purposes and that it would not buckle to U.S. pressure to halt plans for further nuclear development. He has scoffed at U.N. sanctions imposed on his country over its nuclear stance. The sanctions have limited Iran's ability to attract foreign investment, pinched its ability to import gasoline, created a drag on its shipping business and hurt Iranian banking relationships worldwide. Beef with U.S.: SaysU.S. government is "first enemy" of Venezuela. Background: Chavez has a long history of attacking U.S. policy. At the General Assembly in 2006, he called former President George W. Bush "the devil" no fewer than eight times. "The devil is right at home. The devil, the devil himself, is right in the house. And the devil came here yesterday. Yesterday the devil came here. Right here. And it smells of sulphur still today," he said. 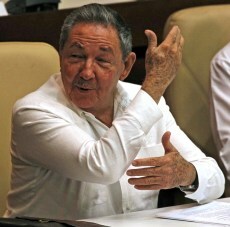 The populist leader of a self-declared "socialist revolution," Chavez supports Cuba economically and politically. Recently, Chavez softened his stance toward Obama. 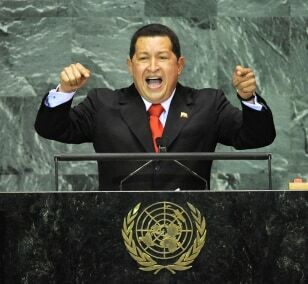 Recalling his "devil" speech, Chavez told the U.N., "It doesn't smell of sulfur. It's gone. It smells of something else. It smells of hope and you have hope in your heart." He has denounced capitalism as being a chief cause of climate change and accused Obama of making lofty promises and failing to live up to them. Beef with the U.S.: Sanctions imposed on the African nation. Background: He has lashed out repeatedly against Western powers, telling them to go "to hell" over sanctions imposed on his ZANU-PF party. The United States and European Union imposed sanctions on state firms and travel restrictions on Mugabe and dozens of his associates nearly 10 years ago, after a violent re-election campaign and often violent commercial farm seizures. 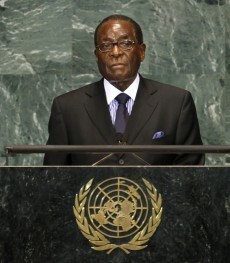 "We say to hell, to hell, hell with them," Mugabe said in August. "Sanctions must go, and they must go. They are hurting our people regardless of political affiliation." The 86-year-old leader said he hoped Obama and new British Prime Minister David Cameron and his deputy Nick Clegg would move to mend ties between Harare and the West. "They have imposed unjustified and illegal sanctions on us. The sanctions are comparable to the military aggression in Iraq," he said. Meanwhile, Obama said he has been "heartbroken" by Zimbabwe's decline. Mugabe was forced into a power-sharing pact with his rival, Prime Minister Morgan Tsvangirai, more than a year ago after a crisis over a 2008 national vote that observers say was marred by violence and fraud. Beef with the U.S.: He says the U.S. is a worldwide dictatorship. Background: Since emerging as the leader in the Sandinista National Liberation Front during the Reagan years, Ortega has railed against what he views as U.S. hegemony. He has defended Iran's and North Korea's right to pursue nuclear technology. In 1987, the Nicaraguan president addressed the world body as the Marxist leader of Nicaragua's Sandinista-run government. He slammed U.S. policy in Central America and told then-President Ronald Reagan that "Rambo only exists in the movies." Reagan referred to Ortega as "the little dictator." 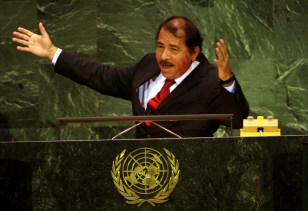 In 2007, Ortega said little had changed since his first visit to the U.N.
"The presidents of the U.S. change. And they may come to office with the greatest of intentions and they may feel that they are doing good for humanity, but they fail to understand that they are no more than instruments of one more empire in a long list of empires that have been imposed on our planet,” Ortega said, waving his arms. The world is under "the most impressive, huge dictatorship that has existed — the empire of North America," he said. He defended North Korean and Iran in their push for nuclear technology. Said Ortega: "And even if they want nuclear power for purposes that are not peaceful, with what right does (the U.S.) question it?" Beef with the U.S.: Accuses U.S. of protecting and promoting drug trade. Background: Bolivia's first indigenous president, a fierce critic of Washington and global capitalism, wants to reverse centuries-old inequities in his country, which has long been dominated by light-skinned descendants of Europeans. The indigenous minority didn't have the vote until 1952. 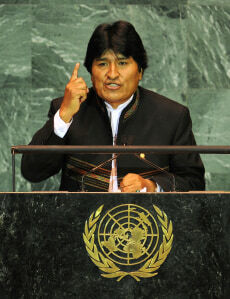 Morales is a close ally of Venezuelan President Hugo Chavez. In promoting a socialist agenda, he nationalized control of Bolivia's natural gas reserves in 2006, alienating many investors and further polarizing South America's poorest nation. Two years ago, Bolivia kicked out the U.S. ambassador, accusing him of conspiring against the government. All U.S. Drug Enforcement Agency agents and other personnel also were expelled. Beef with the U.S.: Accuses U.S. of controlling the U.N. Security Council. 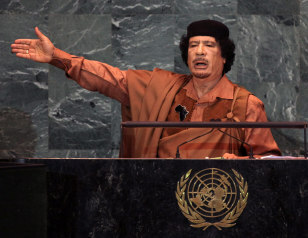 Background: Gadhafi made his first appearance at the U.N. last year. He slammed the Security Council and chastised the world body for failing to intervene or prevent some 65 wars since the U.N. was founded in 1945. Gadhafi called for reform of the U.N. Security Council, which has 15 members, including the United States, and leads the world body's mandate to maintain international peace. "It should not be called the Security Council, it should be called the 'terror council,'" he said. "Hence, the Security Council has been reduced to one country which controls it, therefore forming a danger to world peace." Tensions were high following Scotland's release of Libyan Abdel Baset al-Megrahi, who was convicted of the 1988 bombing of Pan Am Flight 103, in which 270 people died. Secretary of State Hillary Rodham Clinton and U.S. Ambassador to the U.N. Susan Rice left before Gadhafi even took the podium. Israel's U.N. delegation walked out during the speech. Iran's president also left before the speech ended. Ninety minutes into Gadhafi's 96-minute speech, an exhausted English-language interpreter passed out and was relieved by another translator. Beef with U.S.: Sees U.S. as enemy since 1959 Cuban revolution. Background: When Cuba's parliament named Raul Castro president in 2008, it ended nearly 50 years of rule by his brother Fidel but left the island's communist system unshaken. The United States and Cuba have not had formal diplomatic ties since 1961, though Washington is represented by a U.S. interest section in Havana. Since 2009, Obama has eased travel and remittance restrictions imposed by his predecessor, George W. Bush, and resumed migration talks and direct postal service with the island. Reuters, The Associated Press, The New York Times and msnbc.com research contributed to this report.